Cleo County new tower – Bleu Casa, a upcoming residential venture. Cleo County presents new tower – Bleu Casa starts with 3BHK of 1350 sq ft. Situated in the most elegant location of sector 121 Noida. The project is combination of both comfort and luxury. It offer 3BHK units designed by the most renowned architects of the Indian real estate market. It has complete safety of the residents with the help of a world class security system including guard facilities, video door phone and round the clock CCTV surveillance. The project offers huge amenities like jogging track, banquet hall, spa, swimming pool, gardens, parking, and many more. Cleo County set new tower named as Bleu Casa in Sector 121 Noida. Cleo County Bleu Casa offers luxurious apartment in your budget. Project is located at Sector 121 Noida which is very close to many place of Noida, Ghaziabad as well as Delhi. 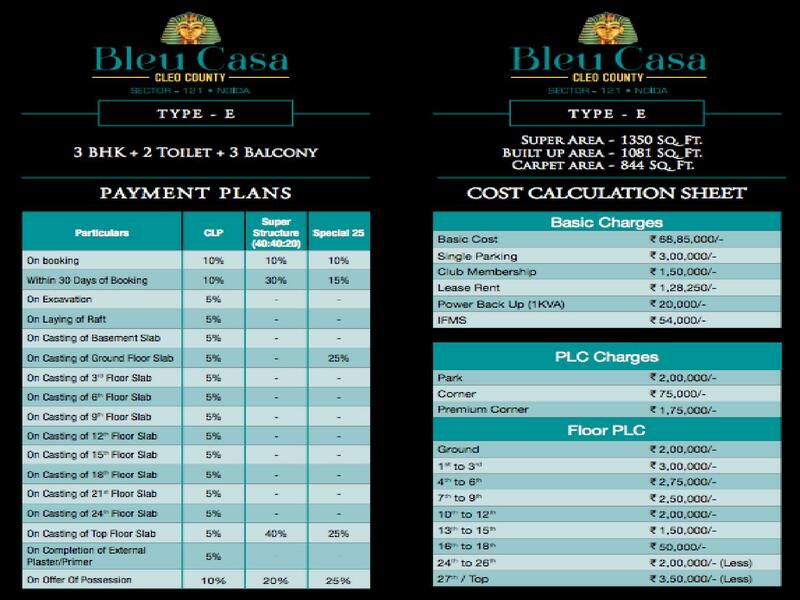 Cleo County Bleu Casa price is affordable and with in your budget, just starts from 68.85 Lacs. Also having best payment plan option. Payment plan is listed below. Furthermore, if you are willing to book your dream home at dream location of Sector 121 Noida than Cleo County New Tower – Bleu Casa would be best choice for you. Sep2September 2, 2016 • By ncrpropertyblog • This entry was posted in 3BHK, Apartment, Bleu Casa, Cleo County, Real Estate, Uncategorized and tagged 3BHK, Apartment, Real Estate, sector 121 noida. Bookmark the permalink.